Arsenal began their FA WSL Spring Series campaign with a compelling goalless draw against Sunderland at the Hetton Centre. 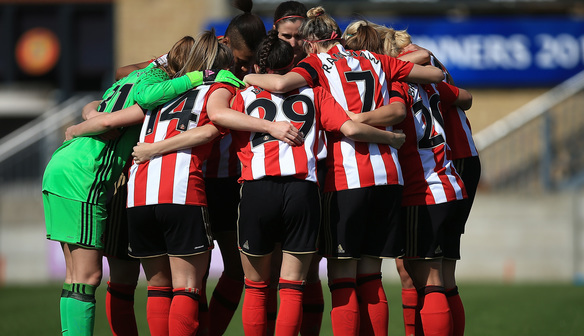 Lucy Staniforth was a rock in the Sunderland midfield and Anke Preuss unbeatable between the sticks as the hosts produced an incredibly disciplined display. It was a second consecutive 0-0 to begin the Spring Series for the Black Cats but it could have been even better if not for Sari Van Veenendaal twice repelling home midfielder Dominique Bruinenberg. The Gunners started the game strongly but could only force a couple of regulation saves from Preuss and the hosts had the first real chance on 23 minutes. The impressive Bruinenberg forced Van Veenendaal to spectacularly tip her powerful header over the bar and then flashed narrowly wide form the resulting corner. Arsenal’s England midfielder Jordan Nobbs flashed a dangerous shot across the face of goal just after the break and Heather O’Reilly fired the follow-up effort narrowly wide. Shortly afterwards Van Veenendaal pushed another Bruinenberg effort over the bar – this one a looped strike from 20 yards – while Nobbs forced a sprawling save from Preuss as her volley with ten minutes remaining was destined for the bottom corner. Preuss then also needed to be alert to repel late efforts from Danielle van de Donk and Chloe Kelly but the Black Cats held on for a well-deserved point. “They are obviously a very good side and we knew that going into the game. They were going to be tough and hard-working with some world-class players in their squad. “We knew we needed to be very well organised defensively and hard-working and hard to beat and I think we did that. “Mel (new head coach Melanie Reay) has done really well since she has come in and instructed us to break the game down into 45-minute games to make sure we can compete in the 90 minutes. “We had our backs against the wall for the first ten minutes of the second half but we defended really well from back to front, including everyone who came on. It was a massive squad effort and we will need that for the rest of the Spring Series. “As a squad we came here wanting to get the three points. The structure they had was very good, they came here to defend and they did that with concentration for 90 minutes and they made it hard for us and frustrated us. “We could have created more clear chances. The result is a fair result but it is gutting for us that we didn’t come here and perform the way we know we can. “We were frustrated in ourselves. Credit to Sunderland, they came out and defended well and if you ask any of their players, they are dead on their feet.